If the Gonzaga Bulldogs beat the North Carolina Tar Heels tonight to bring the NCAA title to Spokane, it will be perhaps the ultimate triumph of the transfer in college basketball. Three of Gonzaga’s five starters transferred in from power-five schools, two of them from the Pac-12. One of those transfers, junior point guard Nigel Williams-Goss, played his first two years at the University of Washington. And Williams-Goss’ success with the Zags highlights an imbalance that worked against the Huskies at the tail end of Lorenzo Romar‘s time on Montlake. By contrast to Gonzaga, the Huskies had only a single transfer from another four-year institution on this year’s roster: backup center Matthew Atewe, who played just 165 minutes despite a midseason injury to starter Malik Dime. That’s been the exception, not the rule, for UW. Over their six-year NCAA tournament drought, the Huskies have had three other four-year transfers: forward Perris Blackwell and centers Giles Dierickx and Robert Upshaw. 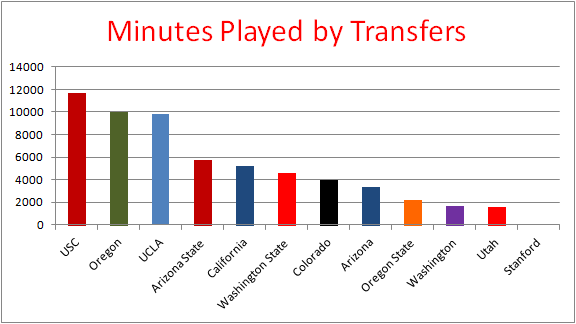 Remarkably, Gonzaga has had more minutes played by transfers in each of the last three seasons alone (including more than 3,000 this year) than Washington over the last six seasons combined. Now, adding such transfers is hardly a guarantee of success, as the example of Washington State — the Pac-12’s worst team over the last six years — suggests. Nor are they necessary to build a winning team; Arizona has added just two four-year transfers over that span, though those players (point guard T.J. McConnell and forward Ryan Anderson) were important starters. Still, as better players choose to transfer throughout their career, adding them is an important tool to add experience to a young roster. The Huskies finished this season 347th in D-I experience, weighted by minutes played, according to KenPom.com. They were in the same spot last year after losing Williams-Goss. It’s also probably not a coincidence that the single best stretch of the last five years for the Huskies came with Upshaw anchoring their defense during the non-conference portion of Williams-Goss’s second and final season at UW. With Mike Hopkins replacing Romar, the question now becomes whether the Huskies will be able to add more talent via the transfer route. Romar was occasionally aggressive in pursuit of transfers, and was close to securing a commitment from Mike Moser in 2013 before Moser instead chose to transfer to Oregon. In part, Washington was surely hurt by the inability to guarantee recruits the kind of March success the Zags have enjoyed on a consistent basis. But the academic requirements the school puts on transfers may also be a factor. The Huskies have never to my knowledge added a grad transfer in either men’s basketball or football. So as college basketball becomes increasingly dependent on the transfer game, Washington may continue to struggle keeping up.